Sklar Brothers and Friends: Tag It! Randy and Jason Sklar began as one zygote and later guest starred in many TV shows including an Emmy Award winning episode of HBO’s CURB YOUR ENTHUSIASM, the FX hit IT’S ALWAYS SUNNY IN PHILADELPHIA, Adult Swim’s CHILDRENS’ HOSPITAL, and most recently in USA Network’s critically acclaimed comedy PLAYING HOUSE, IFC’s hit show MARON, and multiple Season 3 episodes of BETTER CALL SAUL. In addition, the Sklars recently appeared in Comedy Central’s ROAST BATTLE III and CNN’s THE HISTORY OF COMEDY. The Sklars starred as conjoined twins in a memorable episode of GREY’S ANATOMY, and as warring agents on HBO’s ENTOURAGE, of which Entertainment Weekly television critic Paul Katz wrote, “in the hands of comedic masters, The Sklar Brothers, they made it soar.” The Sklars have also appeared in such films as Touchstone’s WILD HOGS, Fox Atomic’s THE COMEBACKS, and the popular Netflix movie TEACHER OF THE YEAR alongside Keegan Michael Key, Larry Joe Campbell and Jamie Kaler. The Sklars also hosted the critically acclaimed History Channel docu-comedy THE UNITED STATES OF AMERICA which highlighted the ways in which statistics tell the story of the US and appeared monthly on Showtime’s JIM ROME ON SHOWTIME in their regular segment “Sklarred For Life,” where they took a humorous look at the past month in sports. In November of 2006, Randy and Jason wrapped the fourth and final season of their cult classic comedy series CHEAP SEATS on ESPN Classic, and wrote and appeared in regular segment “The Bracket” on ESPN’s SportsCenter from 2008 to 2009. In addition, the Sklars regularly fill in as guest hosts for Jim Rome on his popular nationally syndicated radio show. As stand-up comedians, the Sklars recorded their second half hour COMEDY CENTRAL PRESENTS special in November 2009, which premiered in March 2010. The Onion A.V. Club named the Sklars’ third comedy album HENDERSON AND DAUGHTERS in their Top 10 Comedy albums of 2011. 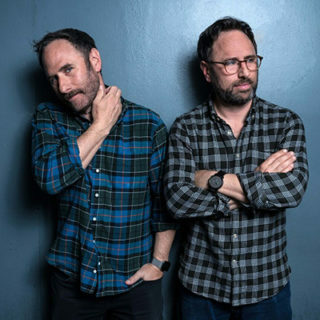 In April 2014, the Sklars recorded and released a one-hour stand-up special and album titled THE SKLAR BROTHERS: WHAT ARE WE TALKING ABOUT on Netflix to rave reviews. Randy and Jason currently reside in Los Angeles, where they record two hit podcasts; for sports fans, VIEW FROM THE CHEAP SEATS stands squarely at the intersection of sports and comedy, boasting huge guests of both worlds, from Bill Burr to Bob Costas. Their other podcast DUMB PEOPLE TOWN is currently being developed by Sony as an animated narrative half-hour comedy co-starring Will Arnett.